Charnley sash windows have been repair, restoration & conservation specialists since 2007. Our mission is to provide the highest quality repair, draught proofing & decoration service available. We strive to give the finest finish, security & function standard whilst ensuring ‘best quality practise’ throughout the restoration / conservation process. Much of our work is on listed building and/or within conservation areas so we operate on a strict ‘like for like’ repair basis. The 350 year old design of the sash window is highly refined & can be quite varied, so we respect it constantly during our operation. With listed buildings and conservation regulation, the original (or newer) windows will be protected. As a result, if they require replacement you will have to apply for planning consent. We avoid the need for this with our ‘like for like’ maintenance & repair. We simply respect the design and do not deviate from it so retrospectively, nothing has changed but the condition of the window. 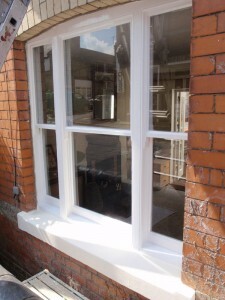 There are many repairs that can be made to a sash windows that will avoid costly replacement. We use the industry leading treatments, resins & timbers to seamlessly splice repair where required. Each is finished neatly and blended into the original design. It becomes virtually impossible to see our repair work once decorated. Great attention goes into diagnosing the cause of a repair so that long term issues can be resolved offering reduced future maintenance. 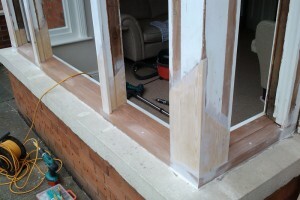 Our unrivalled craftsmanship allows us to make repairs on windows where other tradesman might not find it possible. We do everything we can to retain as much of your original window, re-making replacement parts of a window before suggesting a costly replacement. Charnley Sash Windows have completed thousands of repairs! This sash window represented a typical example of what we find on a regular basis. Whether or not it is under layers of clean white paint or not, Charnley Sash Windows will always scrape back to wood on all area’s of suspicion. Really difficult to operate - Eased and balanced, lifters introduced. Putty and glass repairs also contribute to fixing rattles and draughts. Charnley services carry out complete glass replacements & putty repairs. We work as we would expect a tradesman in our own home. We use dust-sheets & leave working areas tidy, windows secured at night, and finish by cleaning where we have been. Your sash windows were designed to be maintained every 12 – 15 years. These hand crafted windows consist of 15 major parts, all of which can be serviced or replaced if required. 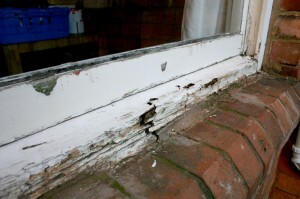 Rotten wood can be cut out, affected areas treated and new timber spliced in place. Broken glass can be replaced and a number of security options can be fitted. Small repairs can be made using the appropriate epoxy or thixotropic resins and finished perfectly in-line with original profiles, leaving seamless repairs every time. 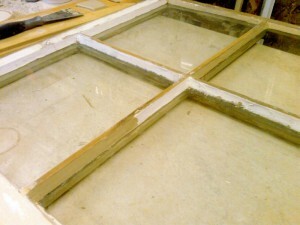 The restoration of a sash window varies from case to case. Typically those on the south face of the property are worst affected due to the nature and direction of the weathering. 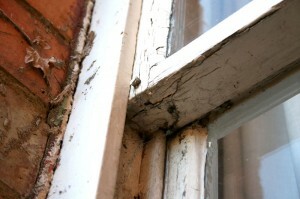 Our comprehensive restoration methods ensure that every part of the window is serviced. Your windows will work perfectly and look fantastic. 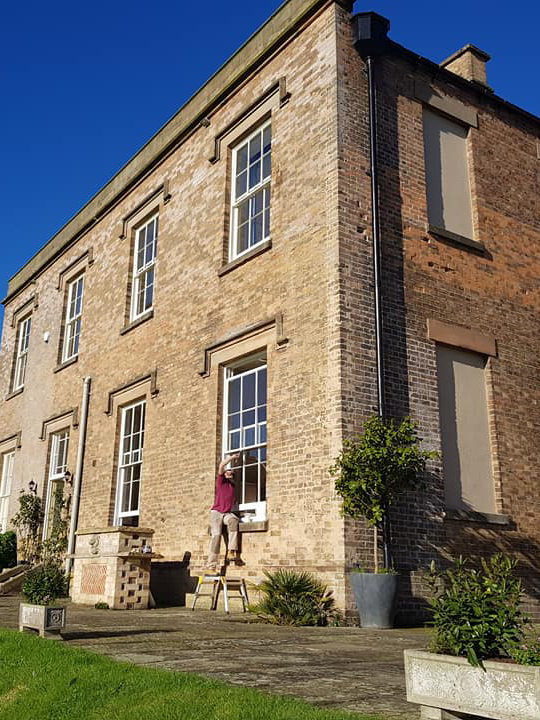 The restoration process is carried out weekly on sash windows for our customers in the local areas of Northamptonshire, Kettering, Corby, Milton Keynes, Banbur, Towcester and other nearby areas. Traditional sash windows require periodic maintenance to ensure they continue to work effectively and maintain their appearance. 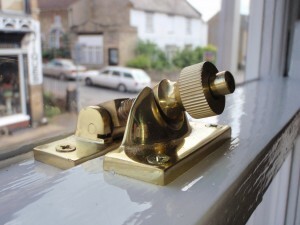 Over the years, the timber in your sash windows is likely to have been filled, repaired and painted many times. 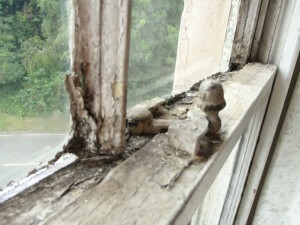 It is important that old sash windows are cared for correctly as they soon fall into disrepair if left for too long. Windows are exposed to the elements 24/7, so they will eventually falter. Timber sash windows are no exception. Unfortunately, it’s the nature of the materials used to create these beautiful windows. If you suspect your heritage windows need any sort of repair or maintenance work, just get in touch. We would be delighted to send one of our skilled craftsmen to provide you with a free no-obligation survey and quotation. We supply and fit replacement sash windows of all sizes and quantities. Although our bias is geared towards repairing windows wherever possible, sometimes our customers’ windows are beyond economic repair and replacement is the only choice. Each of our replacement windows is bespoke and is usually replicating a local moulding & style. A great deal of consideration goes into design, manufacture, fitting & finishing to give the required finish & function. 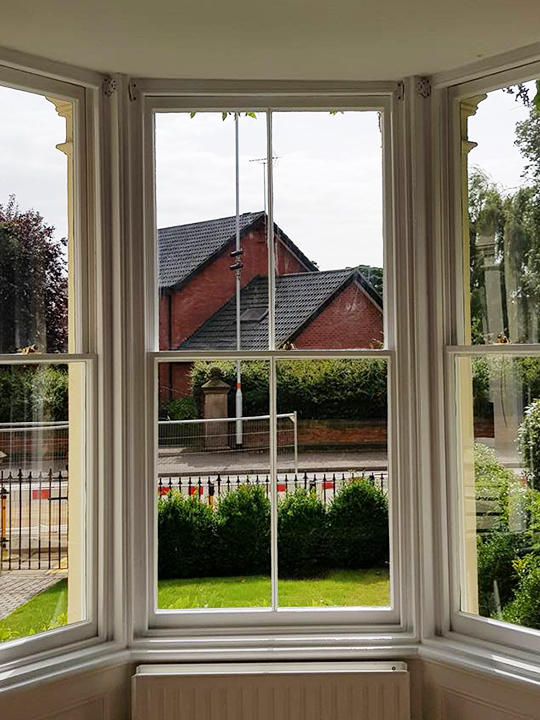 If you want to add sash windows to something like an extension project, we can create exact matches from the other sash windows in your home, or to a style of your choice. We can do most things when it comes to sash windows. The original glass in sash windows can be beautiful & often antique, but unfortunately it is thin and weak. Over time, cracks or breaks occur and it is important that the correct glass replacement is made. Often our customers have been advised by conservation officers, and we are capable of satisfying all heritage and conservation legislation. There is a wide variety of glazing options available for sash windows but there are points to consider. With vertical sliding sash windows, we often find that the replacement glass is thicker than the original and as such the window becomes heavier than the weights designed to balance it. In most cases we can add lead weights to compensate. 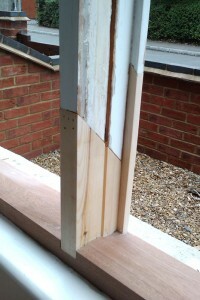 The modification required to convert existing (original) sashes for DGU’s is complicated and difficult. We do not recommend this kind of conversion and instead advise our clients to consider manufacturing new sashes, designed to take the correct units. The new sashes are designed to take the deeper DGU & shaped precisely into their original box. The box / frame often requires repairs before being upgraded to take the new sashes. Pulleys, cords & weights are replaced and everything gets sealed and decorated. We would assemble them with draught proofing throughout and we ensure a precise, tight fit every time. We use a range of weather piles to ensure we get a full and complete seal on closure. This service comes at a premium due to the additional glass, joinery, design & fit requirements. It is not generally suitable for listed buildings or buildings within conservation areas unless special planning permission has been granted. Warning: We have been asked to repair many failed (completed by others) conversions in the past 10 years or so. We have seen many design faults and I have lost count of how many times I’ve heard the phrase ‘I regret that we lost the originals’ this is usually after many thousands have been spent. In one case we have seen a DGU fitted but no draught proofing in place, in another the sash cords would break releasing the sashes into an extremely dangerous free fall. Ensure you aren’t making a mistake and use sash window professionals from the start. We offer a wide range of options here and can suit all needs. Original fixings are often fatigued or broken and we commonly encounter window security that leave properties vulnerable. Charnley Sash Windows use high quality locks and fittings which not only provide higher levels of security, but also act as a clear and visible deterrent to the opportunist. We can also install much tougher glass such as 6mm laminated security glass. Our standard security pack is available in different variations and finishes to match your home. This generally includes 1 x Brighton Fastener, 2 x Lifter hooks (bottom window), 2 x Sash restrictor Bolts. This makes a good comprehensive security package for any sash window, with the added security of child-friendly removable restrictors that limit the travel of both the upper and lower sash over a shared opening distance. High quality solid fixings are available in a large range of styles. Our most common lock is the sping-loaded Brighton fastener. It stands upright, meaning it can be checked at a glance if secure. When locked, they pull the meeting rails together complimenting our 10-point Draught-Proofing system. This ensures a secure and tamper-proof window from the exterior. 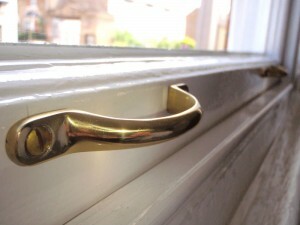 Fitted internally to the bottom rail of your lower sash, lifters serve as an easy and safe way to operate your windows. They also have the added benefit of reducing the stresses and strains that can often damage windows during opening and closing using component parts of the window. These are also available as matching D-handles to be attached to the underside of the upper window internally. D-handles come with the added bonus of making your windows look smarter and keeping hands away from clean glass and paint. This makes them a popular choice. We fit restrictors discretely up the sides of the upper sash internally. Our customers are motivated by a number of incentives to fit these. First and foremost is to allow a sash window to be left part open for ventilation without compromising on security. Another aspect is that when windows are shut and locked these restrictors form another layer of security if the window has been forced. Sash Restrictors also make a window secure from the inside should you wish to limit the movement for safety reasons, such as a first storey child’s room. All our restrictors are carefully fitted and come with a pair of basic removal keys per window. Sash windows are commonly found in Georgian, Victorian and Edwardian buildings. They have been available since the 1600’s and come in a wide variety of shapes and sizes. Some are highly ornate whilst other are simply functional. The sash window consists of an upper and lower sash that run vertically or occasionally horizontally within a timber box. Commonly they are balanced using weights that are housed within the box either side of the windows. Cords attach the counter-weights via the pulleys to match the weight of the window in order to enable a lift & close operation. Sash windows offer great air circulation and have significant advantages in warmer weather. Opening the upper and lower sashes by the same amount allows the hot or stale air to escape at ceiling level, replaced by cooler fresh air entering at the bottom. It is important that old sash windows are cared for correctly as they soon fall into disrepair if left to look after themselves. Removing an antique window from a property can have serious implications on its character and hence detract from its overall value. Sometimes this is overlooked due to the fact that older windows require maintenance and painting, seen as an inconvenience. Our draught-proofing services for windows and doors offer a significant increase in efficiency in the home. This ultimately reduces the use of the heating system. With this in mind we always try and replace component parts of windows where required rather than take the ‘easy-route’ and just install new windows. 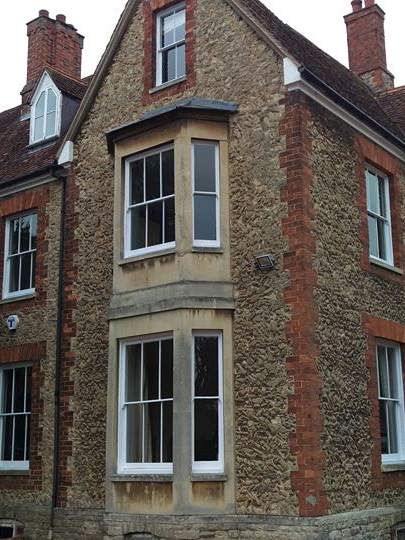 The sash windows we repair in Northampton, Kettering, Bedford and other nearby areas are largely made of pitch pine. Plastic (UPVC) windows with double glazing is now recognised as an unsustainable option by comparison - yet we see them going up in Northampton all the time. They are unlikely to save the money they cost to install due to the environmental impact of both construction and disposal of what is essentially a toxic material. A life cycle that is far reduced by changing trends, hinges and fittings wearing out or breaking, or double glazed units failing and misting over. We do not install them! Charnley Sash Windows has been a quality focused sash window restoration company for over a decade now. We happily serve the people of Northampton, Milton Keynes, Bedford, Kettering, Buckingham, Olney, Daventry, Towcester, and Stamford. The company has become renowed in these areas as the most recommended sash window company because of our attention to detail. You always get quality with us.